Get on your hands and knees, with your hands positioned a little wider than shoulder-width apart. Extend your feet backwards and straighten your body. Keeping your body straight and rigid, inhale as you lower your chest to the floor. Exhale as you push your body back up to the starting position. At the top of the movement, quickly tap your shoulder with the hand on the opposite side, before returning your hand to the floor. Repeat, making sure to alternate the shoulder that you tap. Keep your body straight and rigid. As with all horizontal pushing exercises, keep your elbows tucked into your body a little to reduce the pressure on your shoulder joints. The point of tapping your shoulder is to put your body off balance and thus force the recruitment of stabilizer muscles (especially your obliques) to counter the rotational downward pull of gravity. Make the shoulder tap push-up easier by spacing your feet out wide or by performing it on your knees. Master the push-up before you try the shoulder tap push-up. 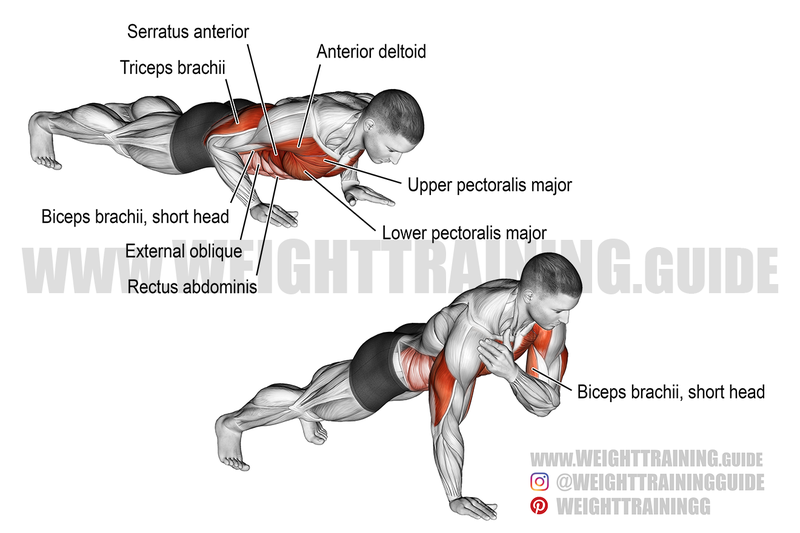 I tried this pushup variation. The wider your hands are placed the more your core has to tense up to keep you from falling. There are so many pushup variations that its a joke. I like this one though.